Author John Caird is an impressively credentialed theater man. He has piled a generous amount of what he knows about the theater, and particularly what he knows about directing, into a nearly 800-page book. Of course, in earning his place in the top tiers of British theater, Caird also seems to have earned the right to express his strong opinions on all things theatrical; and express he does. The tone of the voluminous paperback goes from kindly guidance, to admonition, to the lecturing diction of the strict headmaster who will brook no disagreement. There is too much of Caird’s highly opinionated voice in the book for it to be simply an encyclopedia, and too much factual information and general data about theater to classify Theatre Craft as a long, personal essay. The book’s dense pages are crammed with valuable information about sets, lighting, makeup, acting styles, theater history, and much more. However, the richest nuggets of wisdom are not easily accessible. Even the most practical tips and suggestions are often nested preciously within sometimes rambling treatises. The book invites, and in fact requires, frequent visits with quite specific questions in mind. One cannot imagine wading from cover to cover, unless the fledgling theater director expects to be like the character in Clifford Odets’ Golden Boy who boasts that he is educated because he has read every page of the Encyclopedia Britannica. 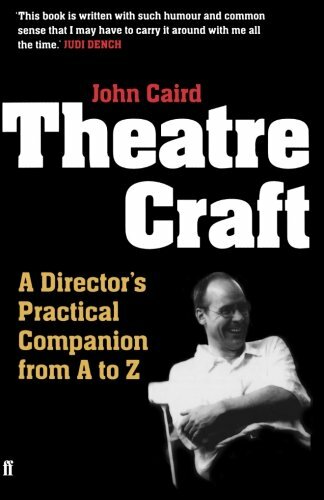 Theatre Craft is a book to consult if you want Caird’s dogmatic assertions about Theater of the Absurd, his slant on actors and their training, or his reasonable and informative description of the costume fitting process that must take place during a play’s rehearsal cycle. He offers the reader some of the theater games he gathered and developed in his long career as a director, actor, and teacher. His paragraphs on how to give successful notes and coaching to the actors under a director’s command are wise and all-encompassing. Caird can be, as noted, strict and didactic. His hyper-practical approach to the business and craft of theater sometimes leaves out the magic. For example, the author is adamant about the uselessness and negative impact of traditional theater superstitions. Yet one could argue that the fact that these harmless tales about not pronouncing the name of Shakespeare’s Macbeth in the theater building, or not whistling in the dressing room, are initiatory symbols and are part of the ritual of passing the craft from generation to generation. One could argue with many picayune points in Caird’s Theatre Craft, but the book has much to teach even the most seasoned theater person. Even with its faults, Theatre Craft is worthwhile. The book is enriched by the author’s solemn respect for the art of theater. Reviewer Martin A. David is an author, actor, playwright, and theater director.